﻿ AMT 1/48 Scale B-26 Marauder Scale Model Manual PAYPAL Ordering. To purchase the AMT 1/48 scale B-26 Marauder scale model manual on printed paper click this PAYPAL button. 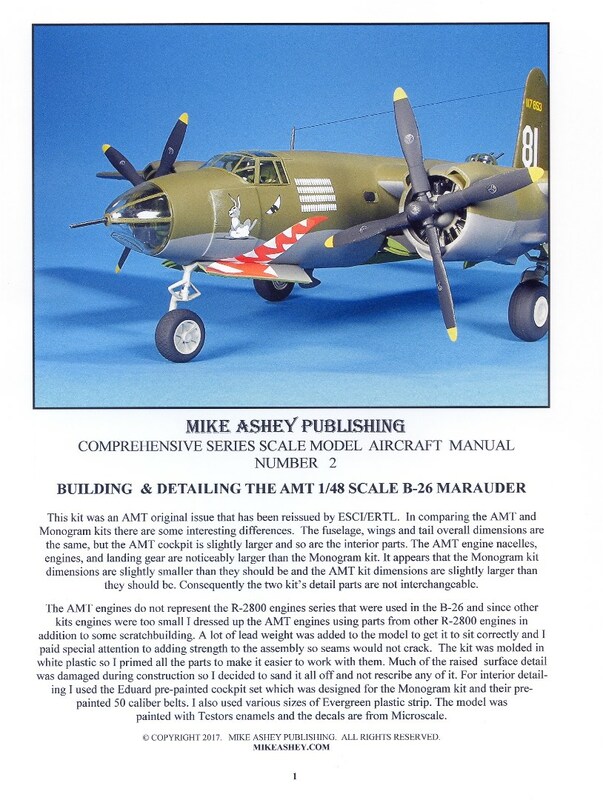 To purchase the AMT 1/48 scale B-26 Marauder scale model manual PDF click this PAYPAL button. Both the Monogram and the AMT/ESCI/ERTL, 1/48 scale B-26 kits are notorious for fit issues. This comprehensive series manual shows you how to assemble the AMT/ ESCI/ERTL kit in the proper sequence while modifying and correcting fit issues during assembly. The manual shows you how to use Evergreen sheet and strip to solve all of the gap issues especially those around the nacelle to wing fit. The manual shows you how and where to add lead weight to balance the finished model on its landing gear. Eduard’s pre-painted interior for the Monogram kit was used to enhance the cockpit along with their pre-painted 50 caliber machine gun belts. The manual also shows you how to reinforce and strengthen each assembly so that seams will not crack or split while you are working on them. The kit’s engines are enhanced with scratchbuilding including adding a wiring harness and spark plug wires. A Step by step painting sequence is also provided along with adding the decals and adding mild surface weathering.